One of the more well thought out and detailed pavilions around World Showcase is Mexico. Situated snugly to left when entering World Showcase from Futureworld, Mexico is a wonderland of little shops, restaurants, attractions, and detail. In no other pavilion does the mash up of modern and ancient work so well. And guess what? Pretty much the whole thing is INSIDE A PYRAMID! The weenie of the pavilion is based on the architectural style of ancient Mesoamerican pyramids. These hulking structures are usually stepped on the outside, with a temple on the top. The Epcot version houses an office at the top where everyone's favorite nighttime spectacular Illuminations is controlled. Inside the structure you will find a central market area selling Mexican crafts, tequila, sombreros, and plenty Dia de los muertos goods. The pyramid also houses San Angel Inn, a sit down restaurant which overlooks the first portion of the Gran Fiesta Tour boat ride. You can also grab a drink (if you're willing to wait in line...) at Cava Del Tequila, the perennial favorite bar on property. An apt example of this style is El Castillo, a Mayan pyramid located on the Yucatan peninsula built between the 9th and 12th century AD. El Castillo is the centerpiece of an enormous complex of smaller pyramids, temples, ballcourts, and markets. 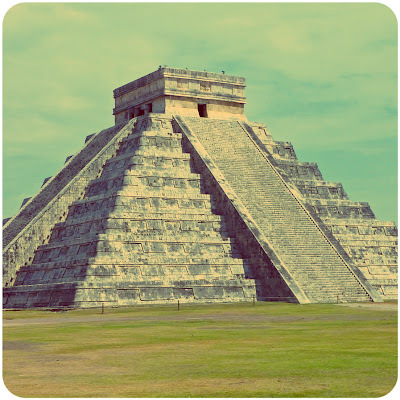 The temple is dedicated to the feathered serpent deity common in mesoamerican culture. Though many of the flourishes have eroded over time, its easy to see how the two buildings correlate with each other. The Mayan civilization was not the only culture thriving in Mexico prior to European discovery, but it is the most representative of the country as a whole...and a great jumping off point for the design of the pavilion.